Our next speaker was Jay Bartholomew, Unit Chief for the Major Theft Investigations Unit at the FBI in Washington, DC. Bartholomew talked about the ties ORC has to other major issues such as narcotics and terrorism, but also stressed the importance of partnering and continued training on the subject. He also put into perspective when to consider using federal law enforcement for help as opposed to local or state level law enforcement and reviewed some of the US code violations that could be used to prosecute someone as part of a larger criminal enterprise. He also warned of the shift states are taking to raise felony levels and shifts federal law enforcement is taking on priorities for investigation. Next, Kevin Plante parlayed a brief update on the state of NEORCA, the New England Organized Retail Crime Alliance, which was launched at last year's event. Plante talked about some of the enhancements being made to the site and how all New England states are involved in the sharing of information not only at retailer level, but at law enforcement level. If you work as a retail loss prevention professional or a law enforcement officer in New England or near New England, it is strongly recommended that you get a FREE membership to NEORCA by visiting www.neorca.org. Law Enforcement Officers of the Year – Peabody, MA law enforcement representatives Detective Ralph Scopa and Officer John Nelson for their long history of investigating and solving major ORC crimes on the North Shore of Massachusetts. Loss Prevention Person of the Year – CVS Health ORC Manager Stefanie Mangiante for her work in and around New England closing some very substantial cases that involved multiple jurisdictions and multiple retailers. 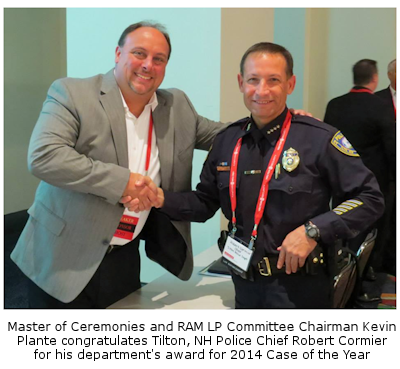 2014 Case of the Year – Tilton, NH police department, led by Chief Robert Cormier, for investigating and arresting a crew of people from PA / OH on counterfeiting charges. This group was passing counterfeit checks and using stolen identities. Those suspects were also involved in a payroll check cashier scheme valued at more than $250K. At the time of apprehension, the suspects also had hundreds of unused stolen identifications in their possession. This likely saved countless people the aggravation of having their stolen identities used for fraud purposes.